In the heart of Washington DC, there’s a patch of greenery curated from all over the world that visitors can view. These plants have taken up residence in the Botanic Gardens, just a stone’s throw away from Garfield Circle. This structure was first proposed in 1816 by the Columbian Institute for the Promotion of Arts and Sciences. The institute was founded by Dr. Edward Cutbush, who aimed to bring culture and learning into each aspect of the city. He felt that DC was the city that should set an example to all others, in terms of appreciation of learning, and set out to create a number of projects to make this a reality. 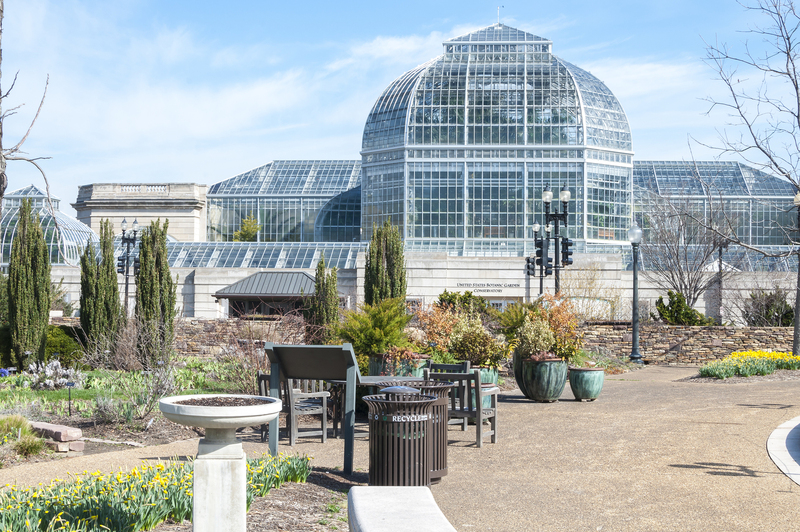 The Washington Botanical Society also petitioned for the creation of the building, as they hoped to inspire visitors with the splendor of their plants. This group still exists to this day, and hold the same goals as always. Under President James Monroe, this plan was finally set into motion in 1820, when he dedicated a patch of land to the project. This land was a swamp however, that had not been used because of its proximity to the city. In these times land could be changed or requisitioned from the owner to create better routes through the city. The previous owner, David Burnes, was told that if he chose to farm there, the crops could be removed and the land levelled to create a new thoroughfare. Over the next five years, the site was drained and enclosed to make it suitable for the endeavor. Construction on this building never actually started though, as the Institute ran out of money and Congress refused to spend any more money on the gardens. It wasn’t until 1867 that the first greenhouse was erected on the land, which needed further drainage after being neglected for so long. The funding for the project came from Congress and the project continued to grow. The gardens became home to a number of historic trees, which may not initially appear like two words that belong together. The Crittenden Oak is one such tree and this was where John J. Crittenden gave an address to try and stop the Civil War. One of the oldest gifts that America had received was also on display, which was a Chinese Oak taken from the final resting place of Confucius. In 1933, the gardens were moved to where they stand today and the flora within has become even more diverse. There are over 10,000 different types of plant life within the structure and some number as many as 165 years old. The greenhouse is divided into different types and areas, like jungle and desert, which viewers can walk around to catch a glimpse of varying ecosystems. This shows how these plants have developed to deal with harsh environments and what sets these plants apart from others. The curators of the greenhouses work with US customs to rehome seized plants that may cause a danger to the ecosystem if not properly contained.